In winter, loss of traction can occur anytime, anywhere – when going too fast around a corner, when dry conditions quickly change to rain or ice, when parked incorrectly on an icy hill, or applying too much brake (causing the wheels to lock). Any of these actions can have devastating consequences. OVER-BRAKING – Braking too hard can lock up the wheels. OVER-STEERING – Turning the wheels too sharply can cause the back end of the vehicle to slide out. OVER-ACCELERATION – Supplying too much power to the drive wheels can cause them to spin. DRIVING TOO FAST – The most serious loss of traction results from driving too fast for the conditions. Always have a load spread evenly from left to right. Make sure the load is secured and correctly distributed over the axles. Ensure your tire tread depth meets or exceeds the legal minimum of 3.5 mm (5/32”). Ensure your tires are properly inflated. Because of differences between tire manufactures’ inflation recommendations, ply rating and load, it is recommended that you visit your nearest qualified commercial tire service centre to ensure your tires are inflated to the proper PSI. Don’t drive too fast for the conditions. For example, when a nice sunny day is followed by rain, oil rises to the top making the road slippery. Slow down. Beware of fatigue. It can affect your ability to read the road and be a significant factor at night when visibility is limited. Note: If the area is icy, spread a little sand under the tires. Gently reduce pressure on brakes – if on ice, push in the clutch to let the wheels turn freely. Turn the steering wheel quickly – look and steer in the direction you want to go. Counter-steer – as the vehicle gets back on course, counter-steer to avoid skidding in the opposite direction. If only the Jake brake is on, turn it off or reduce number of heads applied until traction is recovered. If only the wheel brakes are on, decrease or release pressure on the brake pedal. If both the Jake and wheel brakes are on, turn off the Jake brake or reduce number of heads applied. If still skidding, decrease or release pressure on the brake pedal. Note: If you have to release both the Jake and wheel brakes, gentle application of the trailer brakes can also help. Gently turn the steering wheel back towards centre. As the tires straighten you should “feel” the steering tires recover traction. If both the steering and drive axle tires are skidding, reduce or briefly release pressure on the brake pedal. In icy conditions, wear shoes or boots with good traction. 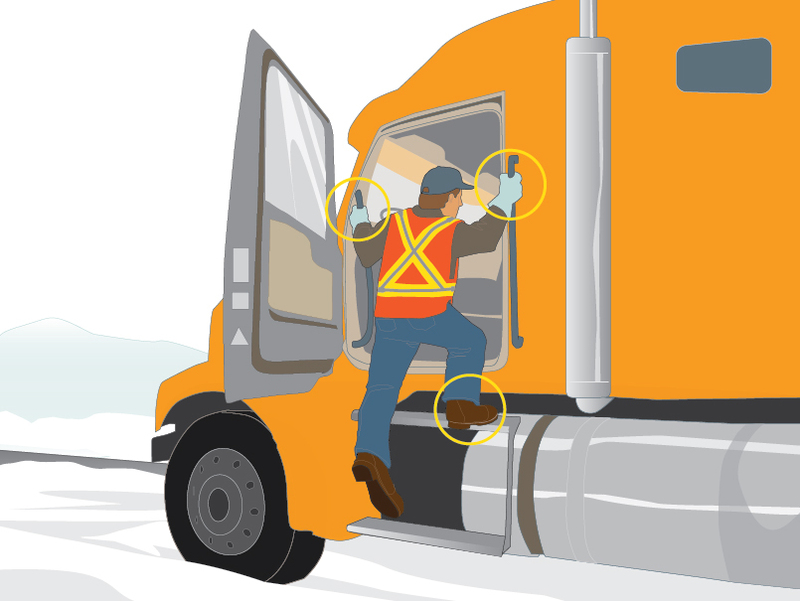 Maintain three points of contact with your hands and feet when entering or exiting the cab. REMEMBER: YOU are responsible for your vehicle and your safety. If the roads are dangerous, let your employer know. Give yourself more time, consider adjusting your route or schedule, or don’t go.